"Your ring is the expression of your love and commitment to each other and the choosing of it should be an occasion of great joy. I believe that for each couple there is that unique ring, the ring that makes you smile and is forever a symbol of your love. Happy Hunting!" Engagement rings worthy of the name. So you are in love, your hearts a flutter, this is it - 'the real thing', you cannot imagine a life without each other. Its commitment time. Time to announce your love to the world. Its ring time. So where did it all start? The Romans gave a ring as a pledge of a marriage contract. This was a simple iron band, the circle symbolised eternity and the cycle of life. Two centuries later the band, now made of gold, was introduced to the Christian marriage ceremony, and has remained so ever since. 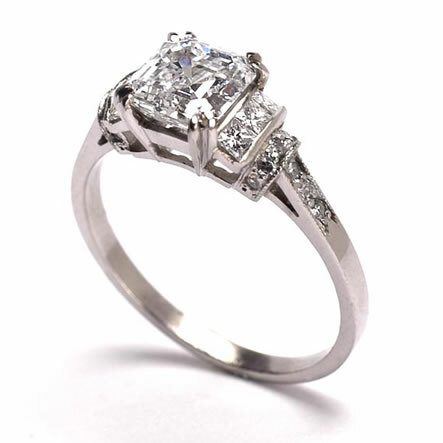 The word diamond comes from the Greek "adamas" meaning unconquerable .Its strength and hardness made it the perfect stone to symbolise love and fidelity. Around the15th century only royal marriages were celebrated with diamond set wedding bands. The supply of diamonds increased by the 18th century, but it was not until the discovery of diamonds in Africa, in 1870, that diamond supply met demand and a diamond engagement ring became a possibility for every bride. By the end of the19th century a bride could expect 2 rings, a gem set engagement ring and a gold wedding band. 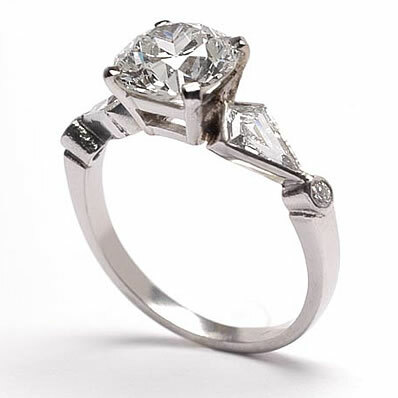 The solitaire diamond ring in a 6-prong setting was introduced by Tiffany in 1860 and has become the most popular engagement ring of all time. 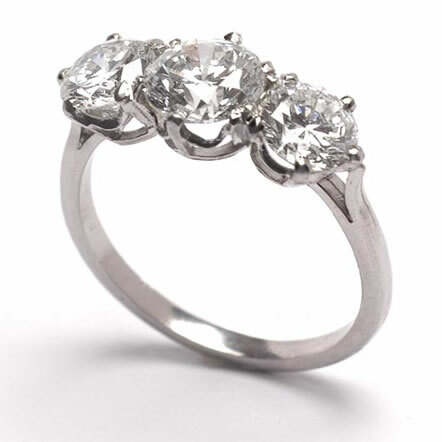 From 1900 platinum, with its brilliant untarnishable whiteness, and its durability and strength, allowed the jeweller to expose the beauty of the stone in a very light setting. 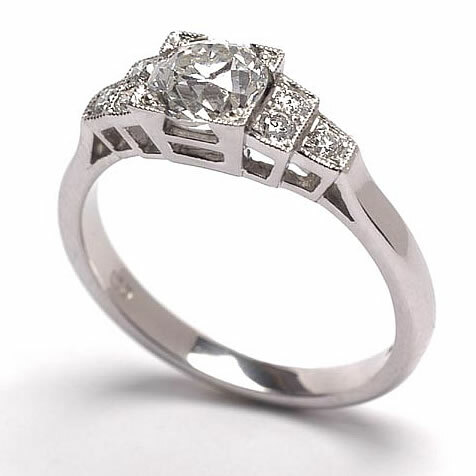 Designs now concentrated more on the stone; the diamond itself has become the ultimate symbol. Buying your engagement ring is a delicious trauma, exciting and terrifying. For some the process of buying can be confusing and intimidating as the customer can be blinded with science. As in so many things the more knowledgeable the seller the safer you are. When choosing your ring the first thing you should look at is the shape of the ring on your hand, like all jewellery it should, in my opinion, enhance you and reflect your personality. Having chosen the shape you should now look at the quality of the stone. Diamonds can cover the entire spectrum of colours: the majority range from those with a barely perceptible yellow or brownish tint, up to those that are very rare and are described as colourless.These colourless diamonds are classed as D-colour, the highest grade, after which they are graded through to Z. E and F are utterly desirable, G to I are nearly colourless and very acceptable, J and K begin to show colour. The colour grade most frequently sold for engagement rings is G /H/I. Almost all diamonds contain minute traces of non-crystallized carbon, refered to as inclusions; they are nature's fingerprint and make every diamond unique. The best diamonds are flawless with no inclusions (FL), these are very rare. The next grades down are VVS (very, very slightly included), VSI and VS2, (very slight inclusions), and SI and I (slightly included and included). The fewer inclusions, the better the stone. Is the weight and therefore size of the stone. One carat is divided into 100 "points" so that a diamond of 25 points is described as a quarter of a carat or 0.25 carats. 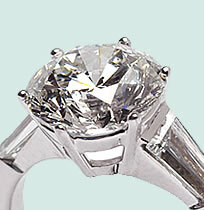 The cut of the stone is not only the shape (round, oval, marquis, square etc.) but also what gives "sparkle and life" to the stone. A well-cut stone will show the maximum life and fire available.